Kisatchie Fly Fishers is based out of Alexandria, Louisiana. Our mission is to promote fly fishing education and conservation in central Louisiana. Our membership includes all levels of expertise. Those interested in learning or improving their skills at fly casting, fly tying, rod building, or fishing strategies will benefit greatly as members of KFF. First and foremost, we are a fishing club. Anyone interested in becoming a better angler, or in joining with other like-minded fishermen who enjoy pursuing a variety of species and waters, from creek fishing to saltwater, are welcome. Unless otherwise noted, our program meetings and fly tying sessions are held at the Rapides Parish Westside Library at 5416 Provine Place in Alexandria. Click here for Google Maps direction. Our program meetings are usually held the 4th Monday of each month, except December. Time is 6:30pm. These meetings are open to the public and include tackle tips, fishing reports, and often guest speakers. The programs can cover a wide range of topics, either fly fishing or of general fishing interest. Our fly tying sessions are usually held the 3rd Monday of each month, except December. Time is 6:30pm. A club member or guest tier leads in the instruction of one or two fly patterns. Attendees can watch or tie along. If you have tools, bring them. If not, then the club has sets of tools for attendees to use during these sessions only. Materials are provided. Beginners are always welcome. For holidays or other conflicts, we may reschedule to a different night. Also, we occasionally have "On The Water" meetings instead of meeting at the library. Please check our Calendar and Home pages for exact dates and locations. During hot summer months - June, July, August - we may have Saturday morning tying workshops in lieu of evening tying sessions. This allows us to bring in guest tiers and cover types of tying, or types of flies, that require more than 90 minutes. Monthly program meetings, fly tying sessions and Fly Fishing 101 are open to the public. Unless otherwise noted, all other club activities, such as trips, are for paid members only. The IFFF is the world's largest organization dedicated to our sport. It's mission is conserving, restoring and educating thru fly fishing. Membership includes discounts on books and videos, as well as subscription to the award winning FlyFisher magazine. Dues go towards conservation projects and causes like Reel Recovery and Casting for Recovery. 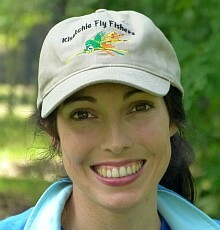 For more details, go to www.fedflyfishers.org. The IFFF is divided into regional councils. Louisiana IFFF clubs and members are by default also members of the Gulf Coast Council, which sponsors a couple of events each year, and is involved in regional conservation projects. For more details, go to www.gulfcoastfff.org. The Kisatchie Fly Fishers is an affiliated club in the IFFF, and a member of the IFFF Gulf Coast Council. While membership in the IFFF is not required for club members, we highly encourage our members to join this wonderful organization. There are several other fly fishing clubs within a 3-hour radius of Alexandria, which annually hold activities for which KFF members are encouraged to participate. - Cane Country Fly Casters of Natchitoches. They host the "Natchitoches Fishing Expo" in even years. This event is the premier showcase in north Louisiana for all types of fishing. Several members of Kisatchie are also members of Cane Country. - North Louisiana Fly Fishers of Shreveport. They co-host the annual "Masters Series" each summer featuring a nationally-renown contributor to our sport. - Pineywoods Fly Fishers of Lufkin, TX. They participate in the annual "Fly Fish Texas" each March and the "Toledo Bend Rendezvous" the first weekend of November. - Contraband Fly Casters of Lake Charles. They host the annual "Contraband Conclave" each August. - Acadiana Fly Rodders of Lafayette. They host the annual "Acadiana Conclave" in early spring. - Red Stick Fly Fishers of Baton Rouge. They host their annual "Red Stick Day" in March. Also club trips in spring and fall to Lake Concordia in Ferriday, for which KFF members are welcome. For KFF members who like to fish from paddlecraft - we call ourselves puddlers - the Lafayette Kayak Fishing Club (LKFC) frequently hold tournaments and other events open to the public. Again, please check our Calendar page often as many exciting things are always happening!